As I have said in many of my reviews, we have four dogs that we love like our children. We have two Boston Terrier mixes that are rescue dogs and two pugs. Our little Gizmo is always cold it seems like, often I find her shivering so I though this would be a great little shirt her. Micha Dog Wear makes this great dog shirt. It’s absolutely adorable! It has peace signs and smiley faces all over and then a big patch that says peace with a heart. The material is really comfortable, it’s not real thick either. The seaming is really well done and secure so you don’t have to worry about it unraveling at all. Simply slip it over their head and put their arms through the arm holes. It only took about a minute to put it on. It’s stretchy (it does run small though). I got the large size for Gizmo and it was loose on her, she’s still a puppy though so I’m sure she will grow into it a bit more. However it is stretchy enough it would fit on a larger dog as well. Very comfortable and breathable. She loved it by the way and fought me when I tried to remove it. Micha has other adorable designs as well so make sure to check them out! 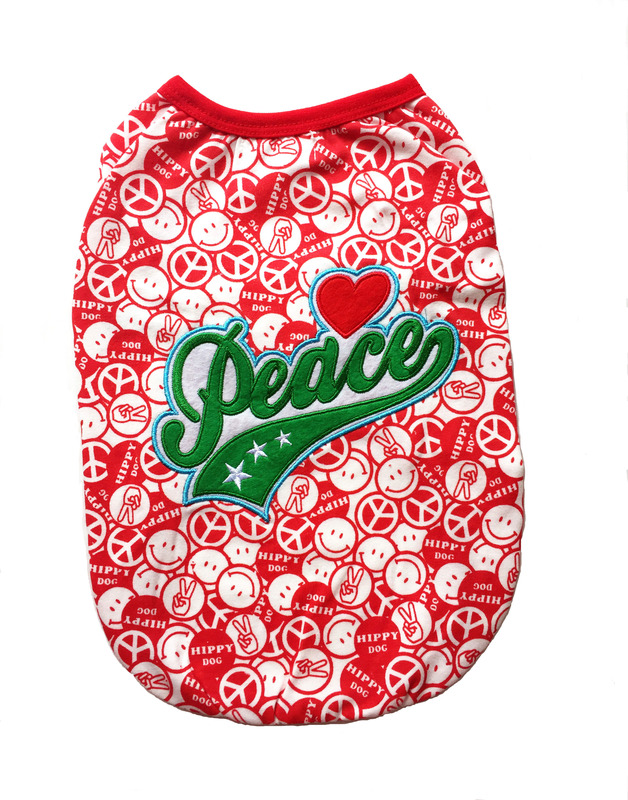 Help your dog promote world peace while they run free in this Peace Hippy Shirt. Shirt features a pattern filled with smiley faces, peace signs and “Hippy Dog” circles. For best fit, measure around the largest part of your dog’s chest for girth measurement. You can purchase this shirt on Micha Website or Amazon!